We keep your lawn looking healthy and green, giving you more time for what matters most. We offer affordable Lawn Maintenance Services, from a reputable company, that will make sure the job is done to your specifications! Our Lawn Treatments are the key to obtaining a lawn that is healthy, green, and weed-free. A lawn that is the envy of your neighbors! Whether it’s a broken head, a ruptured line, or simply a timer that needs configuration or replacement, Grass Masters has your lawn covered... in water! "Matt is so great to work with! He and his staff are friendly and competent. The job was done quickly and professionally. He was even able to squeeze my request in the day I called, which was wonderful. I highly recommend this company!" Mowing, Lawn Treatments, Sprinkler Repair, and More! Are you in need of affordable and reliable lawn care services? Don’t spend your weekends trying to keep up with your lawn. 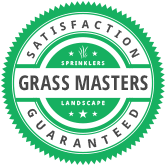 Let Grass Masters do the dirty work, providing you with the highest quality lawn care services. If you want to increase your property’s curb appeal and have a healthy green lawn, then we can help you become the best looking lawn in the neighborhood without all the work. Whether it’s a broken head, a ruptured line, or simply a timer that needs configuraiton or replacement, Grass Masters has your lawn covered... in water! Over time, your lawn’s soil becomes compacted, blocking the free flow of nutrients necessary for growth. Aeration loosens the soil allowing for a thicker, healthier lawn! Thatch builds up from dead grass piling up at the soil’s surface layer which can cause brown dead spots. Removing the thatch allows sun and water to reach the soil and improves the look of the lawn! We can help get your lawn into shape in Spring by cleaning out the flowerbeds and trimming up your bushes. In the Fall, we will remove all of the fallen leaves and debris to prepare for the snowy winter! Stay warm and cozy indoors this holiday season and still have the best looking house on the block without all the work. We use commercial grade products and are 100% insured!